This is our licensed Disney Princess Bounce House. This is the real thing, this is not a cheap imitation of Disney this is the licensed version of Disney princesses. 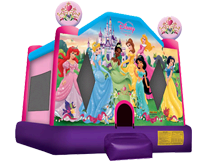 This bounce house is bright and colorful and sure to impress your Disney fanatic. The Bounce house has a safety ramp and large bounce area. we need 18x18 to set up this bounce house and power located within 50-75 feet of where we will set up the bounce house.